So much is happening these days that important causes come and go, or pass through our radar, as if they’re mere trends. It may seem like ages ago that #NODAPL was all over our news feeds – but it was just a few weeks ago that people were pledging their support for the Native American water protectors at Standing Rock, making calls to North Dakota representatives, and sending supplies to the protesters, who held their ground even in brutal conditions. It’s relatively well-known that this particular pipeline was originally set to run through Bismarck, but was swiftly re-routed due to concerns that the pipeline could compromise the city’s drinking water. Standing Rock has been fighting for their dignity, their rights, and even their safety ever since. What is wrong with this picture? Understanding the #NoDAPL fight is crucial for all of us, whether we’re in North Dakota, Pennsylvania, or California – not only because we’re sincere in our intentions to protect the rights and safety of our fellow Americans, but because these pipelines affect ALL of us. There are about 2.6 million miles of pipeline in the United States, and since 2010, there have been 4,269 incidents, including 474 injuries. Questions abound as a new administration takes Washington, and what is to become of the Dakota Access Pipeline is no exception. It will be as important as ever, in 2017, to stay attuned to the facts. Despite the Army Corps’ decision to deny the pipeline permit, the oil company can technically disobey the order, pay the fines, and continue their build. As leaders in any business, industry, and location, we have decisions to make about the type of world we want to help build through our work and our affairs. There are questions of environmental responsibility, integrity, dignity and respect. Each day we have the choice to build that better world, or maintain a status quo that so often fails those who aren’t in power. Protesters remain on-site at Standing Rock in Cannonball, ND, where the temperature is consistently in the 30s or well below. Many people are sending medical resources and supplies to keep conditions safe for those remaining. 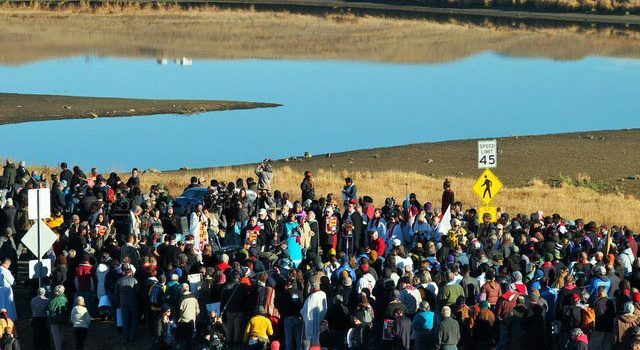 But the tribe is now facing new legislation from the state that essentially criminalizes aspects of protest at Standing Rock, with little to no communication or consultation with those involved. If you’d like to support Standing Rock’s on-the-ground legal team, you can donate here. To keep the protesters well-fed, you can donate here. If you’d like to discover more ways to discuss the Standing Rock protests with your organization and learn how corporate responsibility stems from the basic tenets of dignity and respect, we’d love to help. Contact us at 1-855-222-8211 today. November brings with it a kaleidoscope of fall foliage, cooler temperatures, and our national Thanksgiving holiday, which usually calls to mind the image of golden turkeys, simmering casseroles, and loved ones around a table. November is also recognized as Native American Heritage Month. Because one of the goals of the Dignity & Respect Campaign is to model our 7 Pillars of behaviors, we’d like to focus on one of these principles in conjunction with this holiday: building cultural awareness. The history of this month of remembrance actually began way back in May of 1916, when the governor of New York approved an American Indian Day. In 1990, President George H.W. Bush took this a step further and declared November “National American Indian Heritage Month” which has been ongoing since 1994. The purpose of this month-long dedication is to recognize the historical contributions that Native Americans have made to the growth of the United States, and also to raise awareness about the tribes that still exist today. According to the 2010 census, there are over 5.2 million citizens who identified as American Indian and/or Alaska Native. Even though this number might seem small (around 9.7% of total American residents), it’s actually very significant because these citizens represent a rich community of culture and history that is woven into the tapestry of the United States. What can you do?Cultural awareness is founded in knowledge and education. In order to treat people the way they deserve to be treated, we need to educate ourselves about populations and cultures that are different from ours. So make this month all about learning! Read about the history of the Native Americans that inhabited our country long before it was ever the United States. Learn the differences between the various tribes and how many of them still honor the traditions of their ancestors. The Library of Congress in Washington, D.C. – as well as the National Archives and the Smithsonian – is hosting a range of events throughout November. If you don’t live close to the D.C. area, you can read up on other ways to participate: trying new recipes, for instance, or watching an educational film. The Smithsonian Education group has also compiled a list of resources for teachers interested in educating their students on the history and heritage of Native Americans. Dignity & RespectThe Dignity & Respect Campaign as a whole believes in working towards creating a better world for all of us to live in together. Regardless of whether or not you take an active stance in Native American Heritage Month, we hope that you will both appreciate and respect this special holiday. Your awareness will help to create a stronger and more compassionate America.